As students approach graduation, they often consider the next phase of their work. Joining a professional association is one aspect of professionalization. 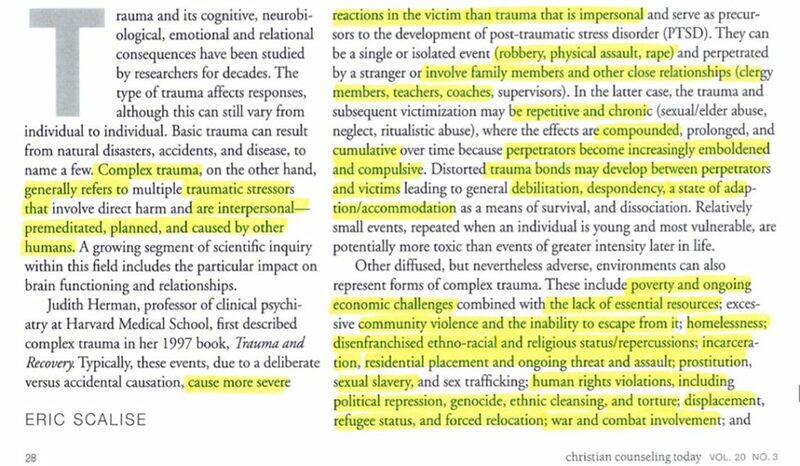 I hope psychology students at grad and undergrad levels consider what Central Baptist College Prof. Aaron New has to say below. The AACC has been promoting its upcoming World Conference this October. One of the special events of the conference is the “Connect U & Young Professionals Panel” targeting college students and recent graduates. As I noticed these promotions last week, it occurred to me that I wish I would have known about the AACC as a recent graduate what I know now. I invested in the AACC for many years, and did so rather blindly for three reasons. One, the organization seemed to be the only (or main) show in town. Two, AACC conferences had all the big names in Christian counseling. Three, my professors encouraged me to be involved. I didn’t ask any questions or pursue any other options. But I regularly gave the AACC my money in membership dues and conference expenses to be part of the club. If I had it to do over again, I would want answers to some questions before making the same commitment. What follows are some questions I encourage students and new professionals to ask AACC leaders and supporters. I will begin with those for which I already have some answers, then I will suggest others. The AACC may not like addressing these questions, but it is not unreasonable to ask them to do so. Is the AACC a member-driven organization? How do members participate in the group? In most professional associations, members serve on committees which serve the profession. Policies are suggested to the governing board made up of representatives elected by members. Those representative deliberate and vote on items suggested by members. Members have input into the rules, ethics and policies that govern the profession. Not so in the AACC. All decisions are made by Tim Clinton. He may use input from others but there is no requirement that he do so. Does the AACC have officers? Who are they? How are they determined? The AACC does *not* have elected officers. Though Clinton promotes himself as the “President” of the AACC, this is a self-appointed title and the position is not voted on. Any other officers are staff hired by AACC and are not elected. The president and staff are not accountable to members. Does the AACC have a board of directors? Who are they? How are they determined? The AACC does *not* have a typical elected board of directors – one that oversees the operation and direction of an organization. Dr. Clinton is not accountable to a board and may run his business in any way he sees fit. If there is any other kind of board? The AACC has advertised several different boards over the years. For many years up to 2018, the AACC claimed to have 1) an Executive Board, 2) an Editorial Board, 3) a Business Advisory Board, and 4) a Clinical and Pastoral Advisory Board (see: http://old.aacc.net/about-us/leadership/). In 2018, the AACC began to promote a different set of boards. 1) an Executive Advisory Board, and 2) a National Board of Reference (see: https://www.aacc.net/wp-content/uploads/2018/01/AACC_Board.pdf). How are ethical complaints against AACC members submitted and how are they handled? The AACC does have a code of ethics. But I am suspicious of how well they enforce this code. Consider this correspondence from September 2018. Readers will notice that it takes some time for the AACC to respond. In the end, the AACC refuses to indicate who serves on the Law and Ethics Committee or how to submit a complaint to them directly (as I think is instructed by the code of ethics). Instead, the AACC states that ethical complaints are to be funneled to the person in charge of public relations for the AACC. How does the AACC decide when/where to be active in political debates and races? The politicization of the AACC has been a concern of mine for some time now. I began asking Dr. Clinton to avoid politicizing the AACC back in 2016. I felt strongly enough about this issue, that I attempted to write AACC board members. This letter became incorporated into an online petition that gathered 190 signatures, though I’m not sure it was very effective. The AACC Foundation is the nonprofit arm of the AACC. What does it do? Where is the data/evidence of this work? Does the AACC profit from the AACC Foundation? The publisher of this blog has looked into the relationship of AACC to the AACC Foundation in two articles (here and here). In summary, the AACC Foundation is a nonprofit means of getting income to the AACC. A miniscule amount goes to charitable purposes. The AACC lists several colleges and universities as “partners” (https://www.aacc.net/schools/). What does this mean, exactly? How does a college/university become a partner? What advantages or benefits do these partners have for AACC members? Since the AACC isn’t a nonprofit like other professional associations, where do the profits from the AACC go? Why doesn’t the AACC disclose financial statements like other organizations do? Who serves on the Law and Ethics Committee of the AACC? How are members determined/appointed? How many AACC members have had their memberships revoked (or been otherwise sanctioned) for ethics violations? For what reasons? What is AACC’s “Christian Care Network” and how does it differ from the new “Christian Care Connect” (that charges clinics/organizations $749/year and individuals $249/year)? To become a member of the CCC, is anything required beyond paying the annual fee? How is the integrity of this referral source maintained? What assurance does the public have regarding the legitimacy of these referrals? What is the relationship between the AACC and all of these organizations? Is there one or more parent companies involved? What loyalties (formal or informal) do these organizations have to each other? About these organizations: Do AACC membership dues (or any other AACC revenues) support any of the other organizations? What staff are responsible for working at multiple organizations? What resources do any of them share? Are there any financial conflicts of interest for any of those parties? Where these organizations are not entirely independent, is that information made available to members/users? I have raised concerns about Tim Clinton and ghost-writing and plagiarism. Has this been addressed by the AACC via their ethics committee? So here is my call to Christian Counselors. Leave the AACC behind. You don’t need their expensive conferences or memberships. You can do better than their borrowed and recycled materials. There are better, more authentic ways of navigating your professional affiliations. I would likewise encourage college students and recent graduates. As the AACC comes courting you, be wise. Ask some hard questions before you settle on your professional affiliations. So, if I understand correctly, there have been “mistakes” for which plenty of others are responsible. Clinton himself, however, is not accountable for any of them. This is not the sort of personal responsibility Christian counselors need to model for our clients. But I digress. In an August 2018 statement to Inside Higher Ed, Clinton’s spokesman mentioned that one book in particular was “under an immediate editorial review.” Later, I became curious about the outcome of this review, so I contacted the publisher to follow up. The book in question is a devotional by Clinton Ignite Your Faith: Get Back in the Fight, published by Destiny Image in 2014. The parent company of Destiny Image is Nori Media Group. After several attempts, I exchanged brief correspondence with a couple of executives at Nori Media. 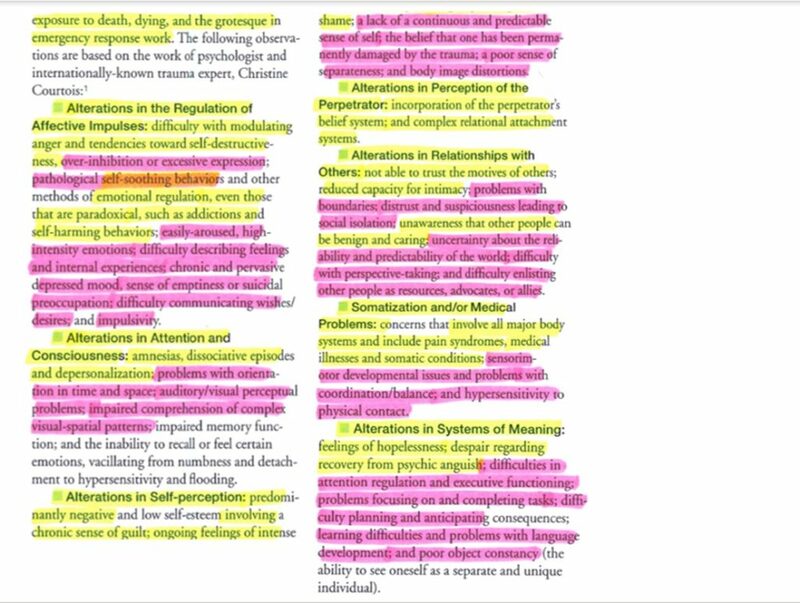 I provided 8 different examples of potentially plagiarized material I found in the book. 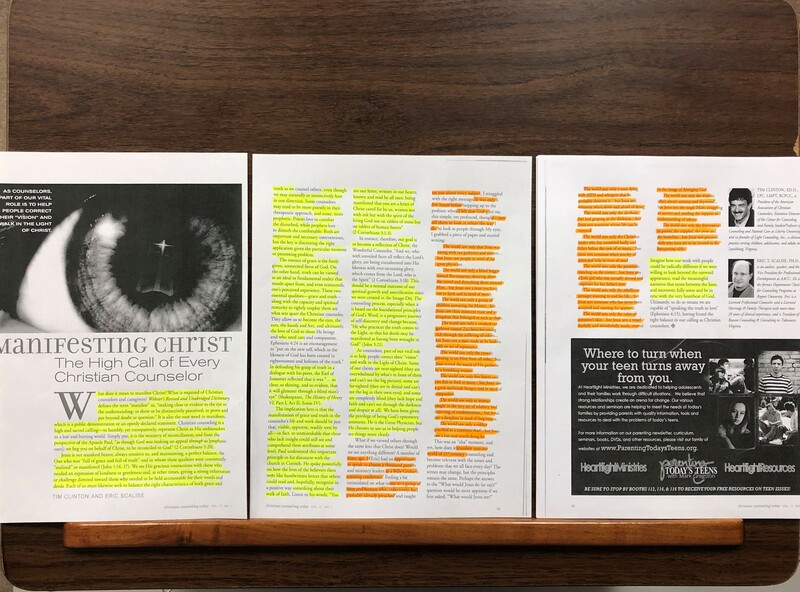 I highlighted each of the “Ignite” passages I found questionable and also provided what I believed were the original sources. Some were only minimally questionable, others were clearly problematic, with the most blatant example being a devotional on day 35 where large amounts of the entry appear to be a cut and paste job from a newspaper article in 1999 (see this post for extensive documentation of the cut and paste job). One executive acknowledged my concerns and thanked me for bringing them to his attention. He promised to “review the documents you have provided for cases of possible plagiarism and take the most appropriate course of action based on our findings.” Since then, I have asked for an update several times, focusing on just 2 questions. (1) Was Nori Media previously aware of the potential plagiarism? (2) What was the result of their investigation and what actions will they take, if any? It is contrary to Destiny Image policy to comment on potential issues of plagiarism or any actions taken related to such. I’m disappointed by this response and wish there was more transparency regarding their findings and actions. As it is, the public is left to just make guesswork of it all. The book does not appear on the Destiny Image website, but a customer service representative said the website has undergone some recent changes and Ignite Your Faith has yet to be added back to the online catalog. The book is still available for purchase from Destiny Image (as are two other works by Tim Clinton). If Tim Clinton and the AACC take plagiarism as seriously as they indicate, I would have expected Destiny Image to be aware of problem and be willing to make a statement accordingly. Without any further details from them, I cannot say with certainty they were unaware of the potential plagiarism, but I suspect that the AACC’s “immediate editorial review” did not include a notice to Destiny Image or Nori Media. Definitely of note, the book is still available to purchase on the AACC website. This is curious, given Clinton’s “zero-tolerance policy” on plagiarism. As I have said elsewhere, I refuse to believe this is an unimportant topic. Our field deserves better than this. As part of reviewing Aaron’s article, I contacted Nori Media Group by phone. The person who answered said Ignite Your Faith was still offered by Nori but, as Aaron noted, the website was incomplete. She then said she would pass along my questions about possible plagiarism and copying to someone in production. She told me that she or another person would call back with an answer. I didn’t get a call. I also wrote Nori and asked why other publishers commented on plagiarism when found in their books. I have not received an answer. Defending himself against charges of academic misconduct last week, American Association of Christian Counselors president and Trump advisor Tim Clinton blamed a former employee for lifting material from other sources for use in articles which carried Clinton’s byline. 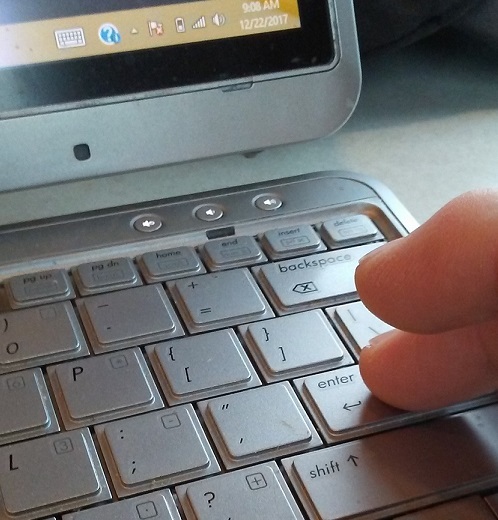 Even though AACC’s code of ethics discourages ghostwriters, Clinton blamed an employee who functioned in that manner for material in his articles which came from other sources. 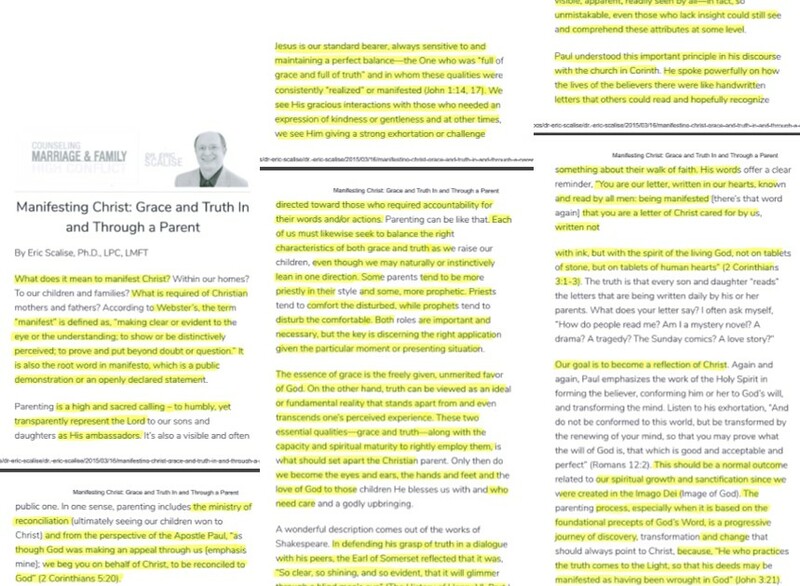 One online article by Clinton [see this article for evidence of copying in Press On from Ignite Your Faith], “Press On,” (cached)* which contained plagiarized material was first published in the book Ignite Your Faith by Clinton and Max Davis. Because I wanted to find out how the copied content got into “Press On,” I contacted Davis for comment (I also contacted Clinton with no response). When I contacted Davis, he said he did not have any part in writing the devotional “Press On.” He added that he always checks his sources and “never once in all my years as a writer has this happened” referring to copied content ending up in one of his books. He also wanted me to know that he was not the fired AACC employee blamed by Clinton for academic misconduct to the Christian Post. 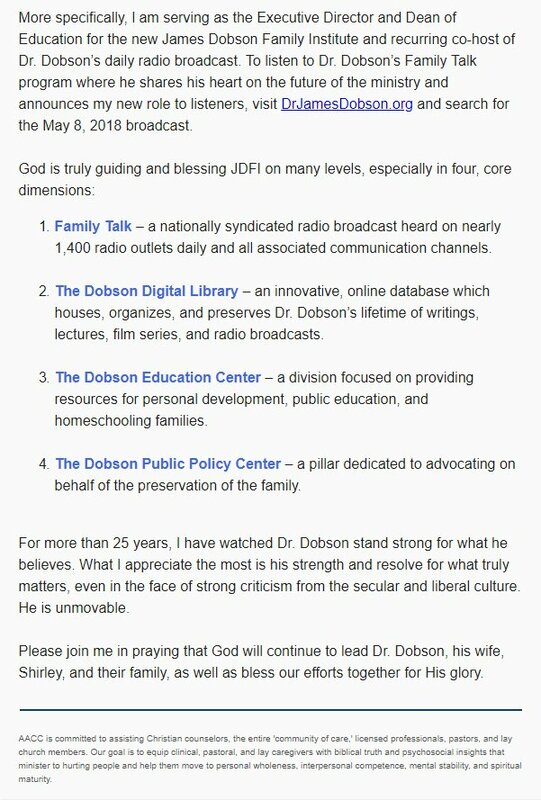 *The same article with the title “Strive to Excel” was once posted on Dr. James Dobson’s Family Talk website. It is archived here. “I started looking because I was curious. I kept looking because I was suspicious. I continue looking because I am incredulous.” I wrote these words over a month ago in the middle of discovering significant number of problems in the writings of Tim Clinton. But they are still true today – I continue to look and I am still incredulous. Warren and I have been documenting citation problems in the writing of Tim Clinton and the American Association of Christian Counselors. My Twitter thread grew long enough, it became nearly impossible to follow without being threaded into a single page. I refuse to believe this is an unimportant topic. And so, despite a tepid response initially from many readers, I haven’t let it go. In fact, I began to wonder if I needed to broaden my search. Questions began nagging me. 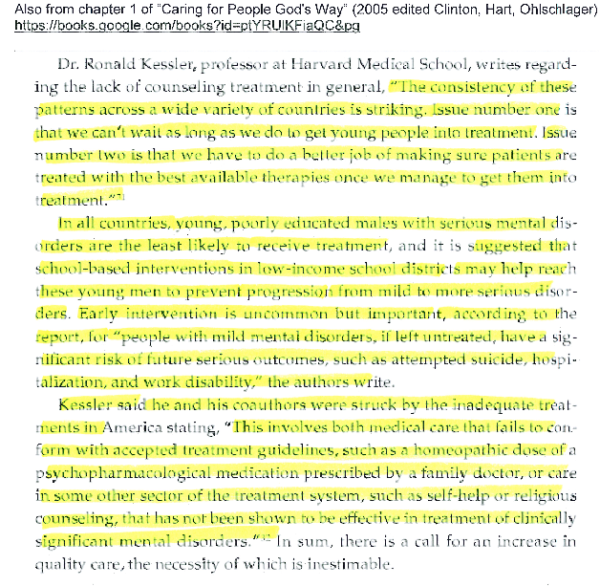 If Dr. Clinton is setting this kind of example, who is following? Is this a common practice among other leaders (both formal and informal) in the AACC? Is what I have found reflective of a broader culture within the AACC? I didn’t like the questions, but I decided they needed answers. What I have found so far has been disappointing and Warren has been gracious enough to give me space to share some of my discoveries. Eric Scalise has long been involved in the AACC. For many years, he was the Vice President for Professional Development. 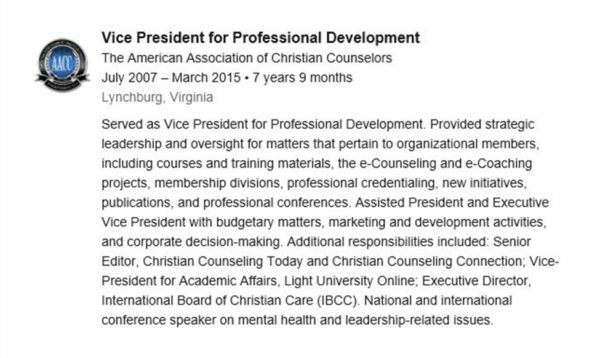 A quick glance at his LinkedIn profile suggests he was heavily involved in leading the AACC. After that and for some time until very recently, he was the Senior Vice President of the AACC. His LinkedIn profile does not describe his duties during that time, but it is reasonable to assume they were leadership responsibilities equal to or greater than before. Since Dr. Scalise appeared to be Dr. Clinton’s right-hand man for many years, I suppose I shouldn’t have been surprised by what I found in some of his writings. But I was. 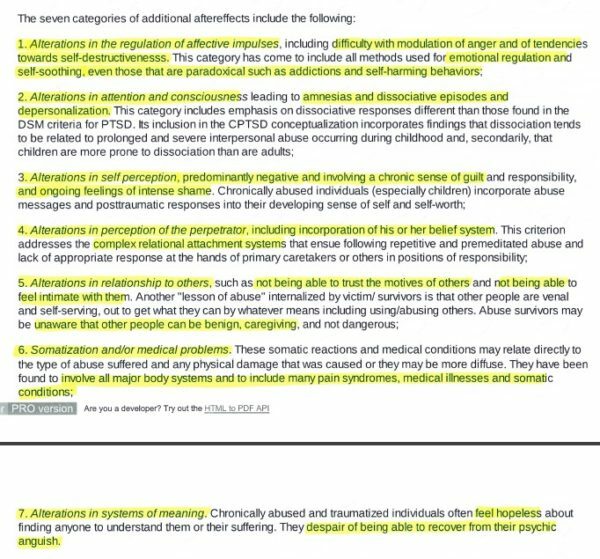 The material in yellow shows up word for word (or nearly so) in one article by Eric Scalise here (below highlighted in yellow). And the material in orange shows up word for word (or nearly so) in another article by Eric Scalise here (below in orange circle). Unless I am mistaken, it seems the most likely possibilities are 1) Scalise used large sections of the original article without giving any credit to his co-author, Clinton. Or, 2) The words in yellow and orange always belonged to Scalise, but Clinton’s name was added to the first article anyway. Either way, there seems to be a problem of author attribution. 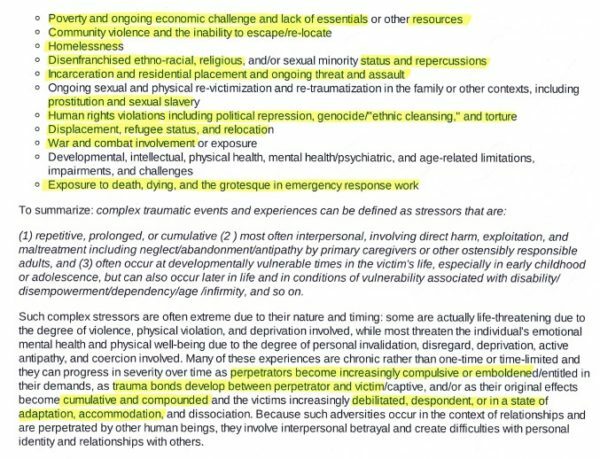 While not always in the same order as in the source articles, the material in yellow comes from another source word for word (or nearly so), “Understanding Complex Trauma, Complex Reactions, and Treatment Approaches” by Christine Courtois. It was published online in 2010. 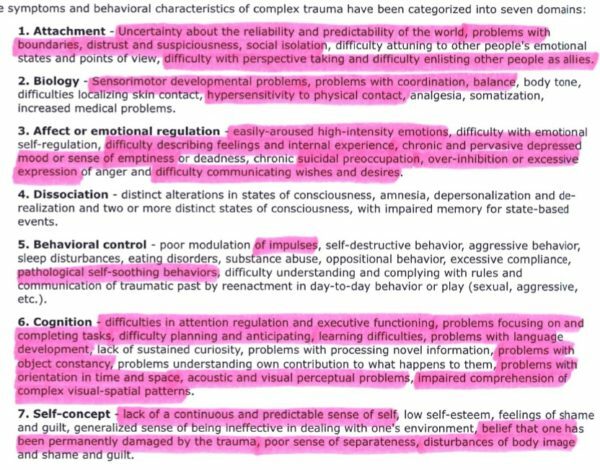 And all the material in pink comes from yet another source word for word (or nearly so), “Complex Trauma in Early Childhood” by Kim Cross. It was archived online as early as 2008. 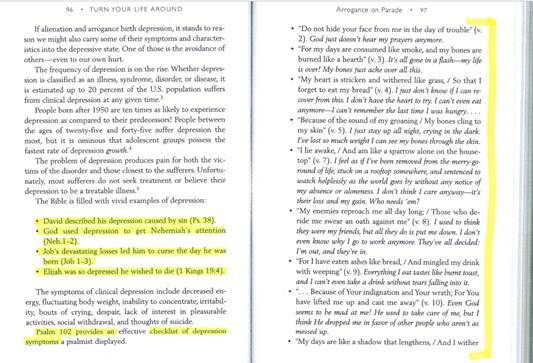 Excerpts are below for comparison. 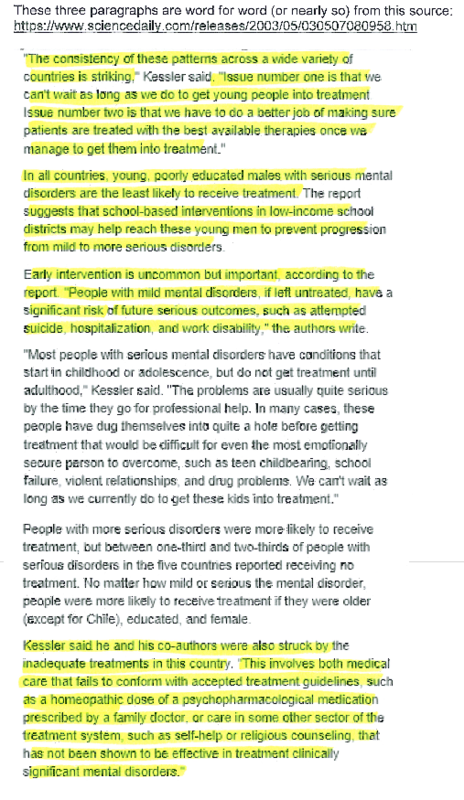 It is worth noting that Scalise does make a citation (#1) for a different Courtois source in his article. I have two observations about that: (1) A significant amount of copied material shows up well before that citation. (2) Scalise says the “observations are based on the work of Courtois.” In reality, they are the observations of Courtois. It appears that he or someone working for him copied the words of Courtois and added the words of Cross to them. I have discovered other, perhaps less serious infractions (like where Scalise appears to co-opt the words of Jay Neugeboren). But this is enough for me now to read all of Scalise’s writings with suspicion. In addition to Scalise, I’m on the trail of at least one other AACC insider.. If/when I can complete that research, perhaps Warren will allow me another post to provide an update. And at some point, it may be also worth re-visiting the story of Les and Leslie Parrott using ResultSource to boost their book sales. All of this has left me profoundly disappointed. The AACC certainly is not the only show in town for Christian psychologists and counselors. But the leaders, speakers, and authors affiliated with the AACC are well-known and influential. I have a vested interest in the field of Christian counseling and I wish that these questions did not have to be raised concerning AACC. If AACC was an actual professional association where the member voted for leaders, then members could express themselves via election of new officers. However, since AACC is Tim Clinton’s business, the members have no ability to bring change. As it stands, there is a path forward for those involved and I’m sure they know what it is. Some semblance of an honest and contrite apology along with a promise and a plan to do better in the future would go a long way to restoring some trust. Until then, I’m afraid AACC and by association Christian counseling will suffer from the appearance of untrustworthiness. On September 24, I started a series of articles on the American Association of Christian Counselors Foundation. Specifically, I am examining what the foundation does. 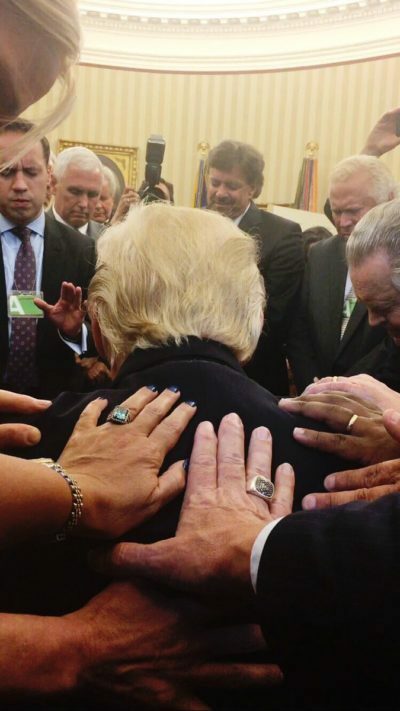 In that first article, I wrote that the AACCF exists to serve the American Association of Christian Counselors, the private business owned by Trump advisor and Family Talk Radio director Tim Clinton. In this article, I compare the stated mission of the AACCF with the expenditures reported on the organization’s IRS 990 filings. What the AACCF is supposed to do depends on the audience. To consumers, the AACCF funds programs which aren’t a priority “in a for-profit business model” which is what AACC is. 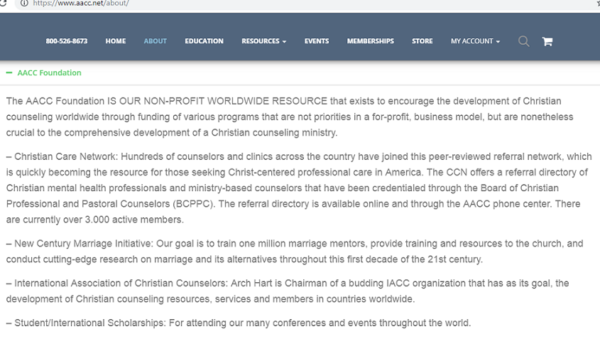 The AACC Foundation IS OUR NON-PROFIT WORLDWIDE RESOURCE that exists to encourage the development of Christian counseling worldwide through funding of various programs that are not priorities in a for-profit, business model, but are nonetheless crucial to the comprehensive development of a Christian counseling ministry. What are those programs? Currently, the AACC website lists the Christian Care (referral) Network, the New Century Marriage Initiative, the International Association of Christian Counselors, and student scholarships to AACC conferences. Elsewhere in the past, AACC included disaster relief in the list. A current website lists a suicide prevention program called Suicide Pair Initiative. I can’t find any evidence of any activity by AACC to put this into motion but AACC has been promoting it since late 2016. To assist in providing a biblical, Christian ministry of the gospel, hope, encouragement and strength to as many people as possible by providing books, tapes and supplies to counselors who can benefit from this service. To the public, the AACCF mission sounds charitable and benevolent. To the IRS, the main activity is more accurately disclosed as a vehicle for the sale of books, tapes and supplies. About 96% of AACCF’s revenues comes from sales of books and supplies; the rest comes from donors. About 98.5% of all revenues ends up going back to the AACC (Tim Clinton’s business) via various fees (employee rental, office rent, etc.). According to the 990 forms from 2002 through 2016, only 1.4% ($122,387) has gone to the charitable causes described on the AACC website. So what charitable purposes did AACCF help? There are so few I can list them by year. In some years, the AACCF declared nothing on their 990 which matched up with any of the purposes listed on the AACC website (e.g., scholarships, marriage initiative, suicide prevention, international counseling associations, etc.). For instance, in 2016 the AACCF took in over $222,000 in contributions but didn’t show grants to any of the priorities listed on the AACC website. The funds went back to AACC via fees for services provided by AACC to AACCF. Of course, there is no bidding process for AACCF to get a good deal on these services. People donate money so that AACCF can spend those funds on services provided by AACC. At least, that’s the story told by the 990 in 2016. There was one other expenditure listed as a grant in 2014. However, it was given to a for profit business belonging to Tim Clinton. I detailed this arrangement in my last post. 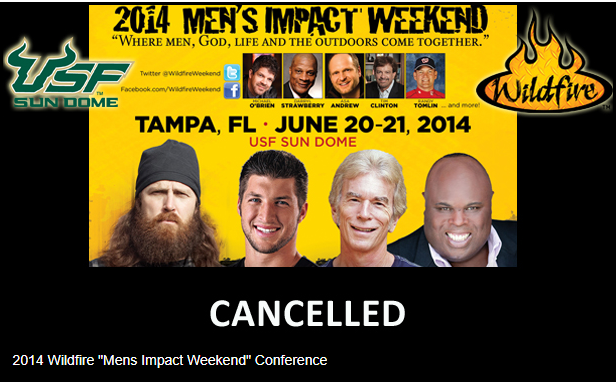 Clinton’s men’s weekend adventure Wildfire Men’s Weekend lost money in 2014. Two donors gave $220,000 to the AACCF apparently with knowledge that the nonprofit would give those funds to Tim Clinton’s for profit business. The AACCF also took $10,000 of unrestricted funds to give to Clinton’s for profit business. Imagine the surprise of donors who thought they were helping international counselors get to a conference, or maybe pitching in for disaster relief. Instead, some of those funds went to the “for-profit business model” that the Foundation isn’t supposed to fund. It is hard to take AACCF’s public mission statement seriously when the charitable giving goes to support the for-profit business. An examination of the 990 forms shows clearly where the priorities are. Anyone can review AACCF’s 990s at ProPublica. By most measures, the American Association of Christian Counselors appears to be successful. The AACC conferences feature big name Christian celebrities and, according to AACC owner Tim Clinton, often sell out. Although there is no way to verify it, promotional material boasts that the business has “nearly 50,000 members” (see Tim Clinton’s president letter on the About tab). Mental health professionals and students familiar with other professional organizations might wonder why Tim Clinton has been the president of AACC since he took over in 1998. There are no past presidents, or a president elect as with other associations. This is because the AACC is Tim Clinton’s for profit business. Members don’t take part in governance of the organization, there is no governing board or council, and no member involvement in setting policy. Over the years, I have studied and been involved in professional associations. In the late 1990s, I was on the board of the American Mental Health Counselors Association as president elect, president and past president of the association. I have served on committees of the American Counseling Association, an umbrella group for several counseling associations. For awhile, I was on AACC’s do-nothing advisory board. From these observations, I can say that there are some advantages to member driven groups (ACA/AMHCA) over a private business model (AACC). An obvious advantage is that typical nonprofit associations* are more transparent than for profit private businesses. Members pay dues and can get access to financial records showing how their dues are spent. Tax exempt organizations file 990 financial disclosure forms with the IRS which are then made available to the public. Not so with the AACC. The AACC did spin off a nonprofit foundation which does report operations on IRS 990 forms and I have started a series analyzing that Foundation. However, the AACC Foundation doesn’t collect membership fees. Members can guess but they don’t know how their dues are spent by AACC. They don’t know how much are spent on salaries, or member services or any important measure of organizational efficiency. Transparency serves accountability to members. In a member driven organization, members can raise concerns about how staff and officers spend money and make policy. They can have input into the budgeting process. If members don’t like what is happening they can voice their discontent directly to those who make the policies via processes spelled out in the by-laws. In member driven organizations, officers are elected to represent members. These officers rotate and allow wide representation of interests. Clinton may create a board as a part of the illusion that the AACC is a professional organization, but it has no power. The members of the board of reference could vote to do something but if Clinton doesn’t agree, it doesn’t matter. In a real professional association, the members matter. Their voice carries weight via a vote for state officers, regional officers and national officers. In this way, the organization’s leaders are accountable to the members. Another aspect of accountability is a functioning ethics process. AACC has a code of ethics. However, I know an individual who wanted to file a complaint but was routed to the public relations director instead of the ethics committee. In such cases, the sensitive matter of an ethics complaint should go to the ethics committee charged with handling such cases, not to a gate keeper. The members of the ethics committee were never identified. Pushing Products or Providing Services? AACC constantly pushes dubious products and certifications. Through AACC, you can become certified as a Professional Life Coach through the Board of Christian Life Coaching. Dina Jones is the executive director; she’s also the director of professional relations for AACC. There are four certifications one can achieve, each with a $199 application fee and a biennial $149 renewal fee. Of course, AACC has something called Light University which offers courses in life coaching which will help meet the requirements. There are more. You can also be certified by the Board of Christian Professional and Pastoral Counselors, and the Board of Christian Crisis and Trauma Response. Just like the life coaching certification program, these boards all have levels of certification with high price tags and renewal fees. The problem is that there is no assurance that these credentials mean anything to anybody. A license with a scope of practice for independent work in a state is what is needed to legally operate as a mental health provider. Health insurers don’t require any of these certifications. These certifications didn’t arise due to a need among professionals or clients; they came about because they generate income for AACC. Nonprofit associations spend time working on member needs. Members are involved in meaningful ways developing policies and practices that respond to actual needs among the members. Different incentives operate in the for profit sector. Instead of responding to what members want, AACC has to sell members on the idea that these certificates are what they want. Christian mental health professionals have professional associations to join (e.g., APA, AMHCA, NASW, AAMFT). However, many also want to come together with a group of professionals of like belief for fellowship and reflection on our vocation. I am leaning toward Christian Association for Psychological Studies as a place for that. For many students in graduate programs, it will take courage to ask hard questions about AACC. Some grad programs are affiliated with the organization. Some professors pad their resume with presentations at AACC conferences and are reluctant to speak out. Some leaders in AACC don’t like the situation but are likewise afraid to give up the benefits of being in a favored position. The fear of speaking out that I continue to hear from psychology professors and students around the country highlights some of my concerns about AACC. Dissent in professional groups should not result in shunning. It clearly does in AACC world. I am rooting for the graduate students to do things differently. *I realize there are differences between nonprofit and not-for-profit organizations but I am referring to all groups which are not in business to make a profit for the owner or shareholders. What Does the American Association of Christian Counselors Foundation Do? Next week, the American Association of Christian Counselors is holding a conference in Dallas, TX. According to the AACC’s owner Tim Clinton, nearly 2,000 people will attend, making it one of the largest gatherings of Christian mental health professionals in the nation. While many think of the AACC as a professional association, it isn’t like any of the other groups for psychologists, counselors, or social workers. Those associations are not-for-profit and are run by representatives elected by members. Officers are elected and paid staff are accountable to the membership through the elected representatives. In contrast, according to all evidence publicly available, the AACC is a for profit business owned by Tim Clinton. According to a 2003 filing with the SEC, Clinton is the sole shareholder of the AACC. Clinton is president for life and the other officers work for him. The AACC advisory board doesn’t have much of a role. I used to be on what is now called the Board of Reference (then called the Advisory Board) and we never met as a board. I was never told I was removed from it. It didn’t matter because we never did anything; it was just for show. Many professional associations have foundations which seek donations to provide support for the profession as a whole. For instance, the American Psychiatric Association Foundation solicits donations to advance research in psychiatry and funds various innovative programs. However, that is not how the AACC Foundation operates. AACC’s business model is complex and because it is a private business, can’t be known with certainty from information available to the public. However, in an effort to better understand the relationship between AACC and the Foundation, friend of the blog and former auditor Jason Watkins and I recently reviewed data from AACC Foundation 990 forms. 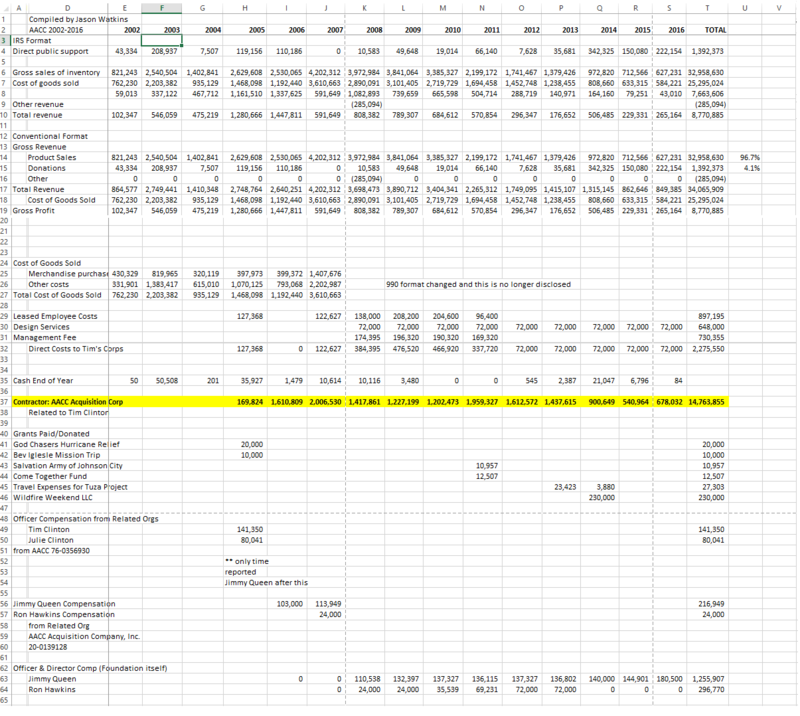 Watkins compiled the data from 2002 through 2016 (see an image of his spreadsheet here). My analysis which relies on his work is below. Essentially, the AACC Foundation collects donations and sells products to support the for profit business of Tim Clinton. Less than one percent of the revenue from the past 15 years has been spent by the Foundation on charitable causes which did not benefit one of Clinton’s businesses. More on that below. Over the past 15 years, $14.8-million was paid by AACC Foundation to Clinton’s for-profit businesses. As noted above only a fraction go to causes that don’t benefit Clinton’s businesses. The head of the Foundation is Tim Clinton’s brother-in-law Jimmy Queen. There is obviously no independence in this arrangement. Queen is COO of AACC under Clinton and he runs the Foundation. Clearly the Foundation isn’t independent of AACC. The 990 disclosed that the funds were used to “support the deficit the organization sustained in holding the conference.” Clinton didn’t make enough money on these conferences so the Foundation’s tax free revenues bailed him out. It is worth noting that it took AACC two years in some cases to return registration fees to people who signed up but couldn’t go because AACC canceled the conference. Some of those bad reviews are still on AACC’s Better Business Bureau page. In recent years, the activity of the Foundation has changed slightly. Revenues from media sales are down while contributions are up. However, on the most recent (2016), no grants to charitable organizations are listed. The Foundation is asked on the 990 (page 2) if any new program services had been undertaken and the “no” box is checked. No accomplishments are listed in the space on page 2 for such items. Funds just go to AACC. Clinton and his folks run busy conferences with many options. 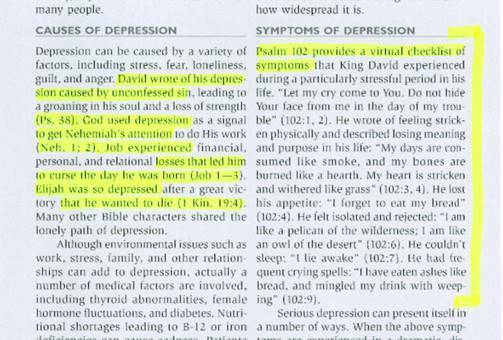 They provide contact with Christian mental health providers who want to explore how their profession and faith interact. 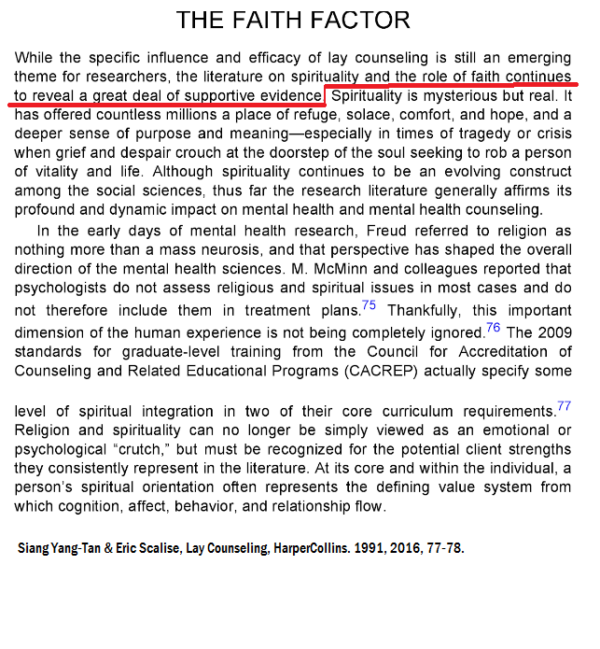 However, Christian mental health professionals do have other options (e.g., CAPS) when it comes to how they align themselves. This information is provided for my colleagues to make informed choices. 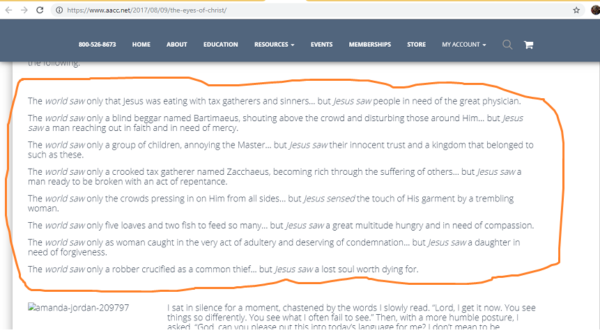 Author Warren ThrockmortonPosted on September 24, 2018 September 24, 2018 Categories AACCTags aacc, Tim Clinton10 Comments on What Does the American Association of Christian Counselors Foundation Do? 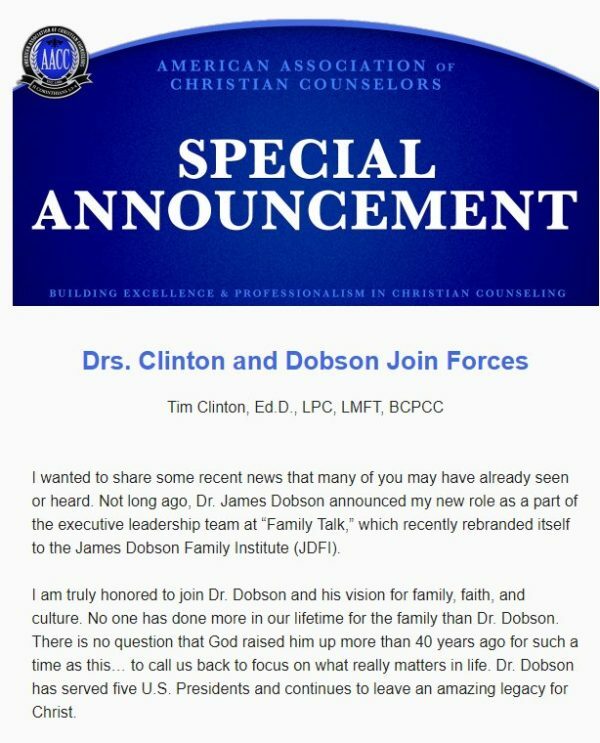 Recently, the owner of the American Association of Christian Counselors Tim Clinton sent an announcement clarifying his relationship with James Dobson and Family Talk Radio. Clinton has recently been embroiled in a plagiarism controversy. Although he denies taking the work of others, through his spokesman and brother-in-law Jimmy Queen, he has acknowledged not writing the material attributed to him where the plagiarism has been found. Thus far, his defense has been to blame others when plagiarism has been found in a book or article. 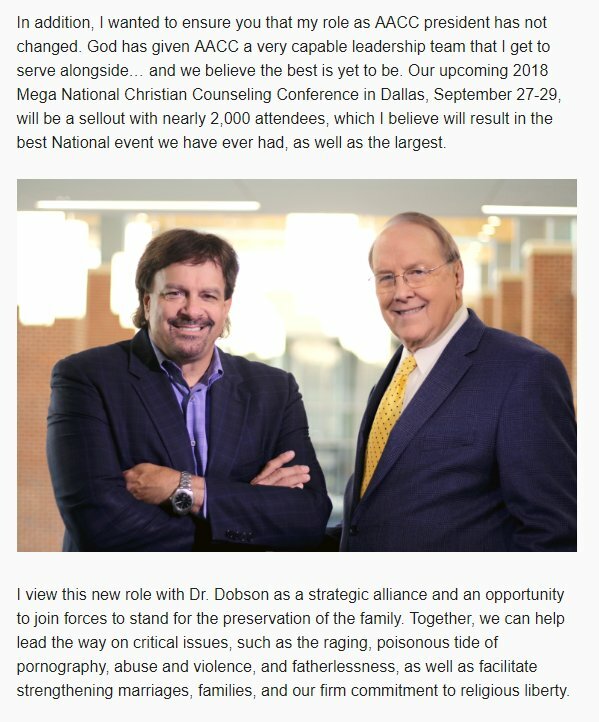 Despite some of those articles being on James Dobson’s website, that organization has not commented on the matter.